Time management and prioritizing are two huge challenges for students (and some of us educators as well). Schools and teachers use agendas, messaging apps like Remind, Monday Folders; the list goes on and on. We know students need a variety of reminders to keep them on track, but what about tools that teach them these responsibilities for themselves. 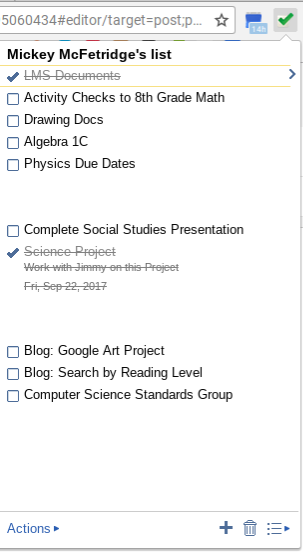 Is there a tool that already exists that teachers can show students how to become more responsible and learn how to prioritize? I believe there is: The Google Tasks Chrome Extension! Google Tasks is a part of the Google Universe that is so simple, that it's often overlooked. With connections in Gmail and Google Calendar, Tasks offers a seamless use for your student's studying and workflow. 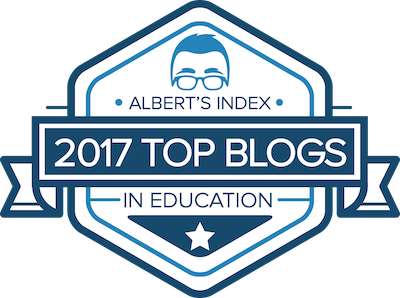 You may be thinking, "That's great, but my students aren't always in their calendar or checking their email when I need them to be keeping up with class assignments." That is why the Google Tasks Chrome Extension is the perfect solution. With the Google Tasks Extension, your complete task-list is only a single click away. Like all Chrome Extensions, there is no need to switch tabs to open your calendar or mail to access your list. 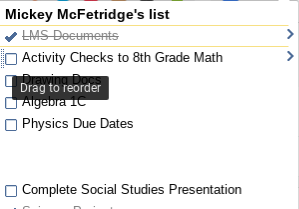 With easy accessibility, your students can now have a quick place to click and add to their to do list. Two excellent features about Google Tasks is that they allow your to rearrange your list by clicking and dragging items up and down the list. 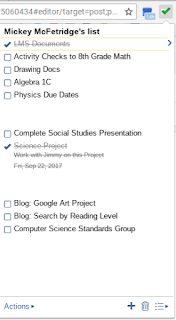 Tasks also allows you to place due dates that automatically sync to your calendar. 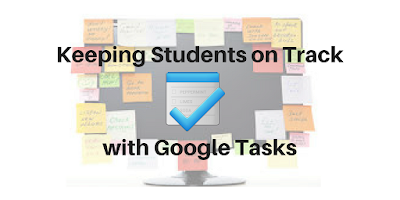 If your school district is a Google Apps for Education district, there isn't an easier way to teach your students (and teachers) task management and prioritizing skills than using the Google Tasks Extension.